The holidays have basically arrived, and many of us are planning on hosting or attending a holiday party or two. Either way, that tends to mean we'll be buying a few bottles of bubbly. Moët Hennessy and Amazon have teamed up to make selecting (and learning cool facts about) Champagne easier than ever. If you have Alexa, you basically just have to ask her for pairing suggestions, correct pronunciations (of only Moët Hennessy products) and other tips. You can even request a special Champagne-centric playlist. 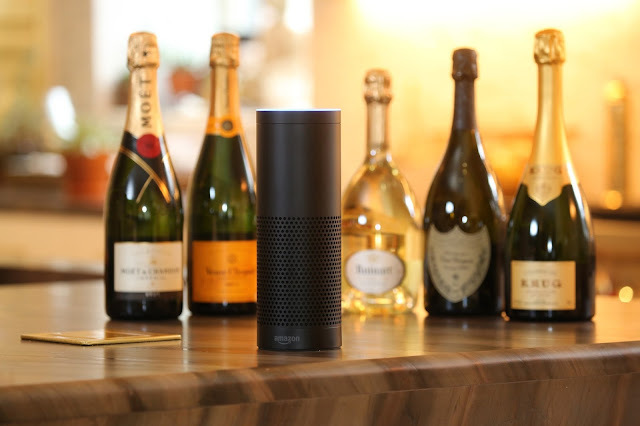 The Alexa skill is actually free, but the bottles of bubbly—not so much. Still... oh, what fun it is to learn, right? So, are you ready to learn why ice rosè is different from other types? It's time to claim your rightful place as the queen of Champagne (at least in your social circle). Oh, and don't forget to check out our Champagne primer featuring our bubbliest friend, Blaine Ashley, founder of NY Champagne Week and Bull de Reve Champagne. *Shoes N Booze may receive commission from purchases made by clicking links on this post.